Mass for those who have died within the last year in our parish will be held during the month of the Holy Souls. Arranged by the Bereavement Support Team of the parish, this Mass allows anyone who has lost a loved one, either recently or over the years to come and remember them and to light a candle for them in front of the Altar. This year, there will be two opportunities for people to come and remember. 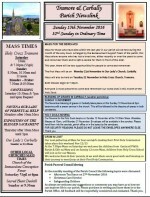 The first Mass will be on Monday 21st November in Our Lady’s Church, Carbally. Mass will also be held on Tuesday 22 November in Holy Cross Church, Tramore. Both Masses begin at 7.30pm. Everyone is most welcome to come and remember our loved ones in this month of the Holy Souls.